Is it old school versus new school with Microsoft® Active® Directory® and Directory-as-a-Service®? It seems like that’s the case. Although to be fair, there are many use cases where one solution is a better choice. 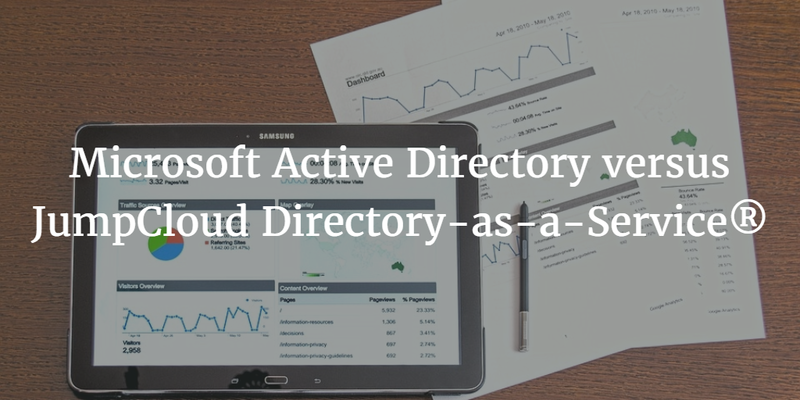 Microsoft Active Directory is the incumbent in the space with a seventeen-year history while JumpCloud® Directory-as-a-Service is the modern, futuristic version of what directory services will be. In talking with IT admins, they know that the world is moving toward a cloud-based directory service. Even the most hardened organizations are leveraging cloud technology, and they need management tools to support them as well. The question for IT admins becomes, is Microsoft Active Directory or JumpCloud Directory-as-a-Service a better fit? AD is largely a Windows platform. Support for other platforms is possible but requires more work and other tools. Directory-as-a-Service is aimed at the mixed platform environments with native support for Mac®, Linux®, Windows®, AWS®, G Suite™, O365™, and many others. AD is based on Kerberos with LDAP support too. JumpCloud’s cloud-hosted directory service supports a wide variety of protocols, including LDAP, SAML, RADIUS, SSH, and REST. AD is an on-prem solution that is run and managed by the organization. It allows IT more control over how the platform is implemented. Directory-as-a-Service is a SaaS-based service. AD is purchased via the normal Microsoft licensing path which includes paying for the Windows Server, server CALs, client CALs, and maintenance. JumpCloud is delivered with a subscription pricing model. These differences illustrate some use cases where Microsoft Active Directory shines and others where Directory-as-a-Service excels. For homogeneous Microsoft environments, it is hard to beat the integration that Microsoft has delivered with AD and Windows platforms and applications. Many of these organizations are also hosting their own infrastructure and are often subject to regulatory issues. In today’s environment, if an organization hasn’t made the leap to the cloud, deep requirements must be preventing it from doing so. In that case, having the control and integration of Microsoft solutions is favorable. For organizations that have moved to the cloud or are leveraging a mixed platform environment, Directory-as-a-Service is the right choice. JumpCloud’s cloud directory treats all platforms as first-class citizens. You can do anything with Linux or Mac OS X that you can do with Windows. That includes being able to manage users as well as the device itself. Imagine having the ability to run GPO-like policies on Mac and Linux devices as well as Windows. In addition, Google Apps and Office 365 are both seamlessly integrated into the platform. As a result, an organization is free to choose appropriate platforms instead of being tied to Windows. As organizations move to the cloud, they are often leveraging the benefits that these cloud providers offer, including the ability to offload hardware purchases, software licensing, management, and maintenance. The cloud allows organizations to purchase what they need in a scalable way. For many modern, cloud-forward organizations that’s a significant cost savings opportunity. Finally, many organizations are moving away from being locked into the Microsoft stack. For them, an independent directory service is critical. Controlling user access is as fundamental as the network itself. Consequently, independence avoids lock-in. Drop us a note to learn if Microsoft Active Directory or JumpCloud Directory-as-a-Service is right for you. Also, feel free to fire up JumpCloud next to AD and compare the two for your use case. Your first 10 users are free forever on JumpCloud.